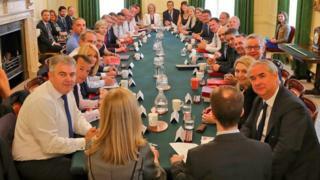 Theresa May's new-look cabinet has met for the first time after a string of resignations over her Brexit strategy left her government in crisis. Mrs May was forced to carry out a reshuffle of her top team after Boris Johnson and David Davis both quit. The prime minister has warned the Tory party it must unite or face the prospect of Jeremy Corbyn in power. Jeremy Hunt, who has replaced Mr Johnson as foreign secretary, said he would be "four square" behind her. After the cabinet meeting, Mrs May tweeted that she was "looking ahead to a busy week". US President Donald Trump, who arrives in the country for a visit on Thursday, said the UK was in "turmoil" and "it is up to the people" whether Theresa May stays as prime minister. Laura Kuenssberg: Could it be opportunity for PM? The UK is due to leave the European Union on 29 March 2019, but the two sides have yet to agree how trade will work between the UK and the EU after that. The delay has been partly blamed on deep disagreements within the Conservative Party over what shape Brexit should take. Essentially the arguments are about how much the UK should prioritise business interests by compromising on post-referendum promises to end free movement of people, remove the UK from the remit of the European Court of Justice, and also have an independent trade policy which allows the UK to set its own trade rules and strike its own trade deals. Last Friday at the prime minister's country retreat at Chequers Mrs May brokered a "collective" agreement on proposals for the future relationship between the EU and UK. However, Mr Johnson - whose departure on Monday followed that of Brexit Secretary David Davis and several junior figures - accused Mrs May of pursuing a "semi-Brexit". 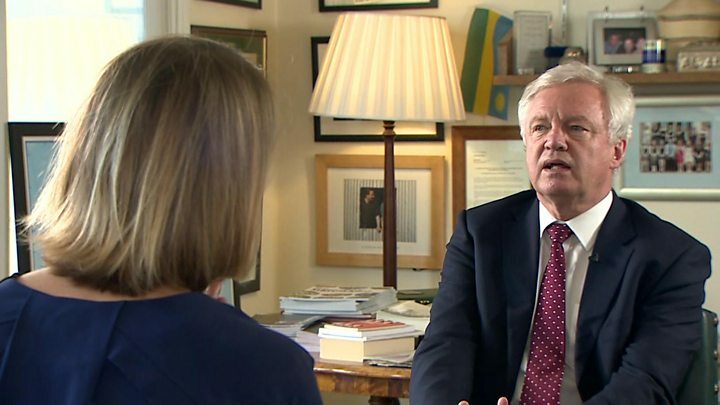 Mr Davis, who has been leading Brexit negotiations for the UK so far, said he did not agree with the prime minister's proposals, so was the wrong person to be going into negotiations with them. He said that the UK was "giving away too much, too easily" ahead of negotiations with the European Union. Several junior government figures also quit, including Brexit minister Steve Baker who told the BBC's Daily Politics they had been "blindsided" by the No 10 plan that emerged at Chequers. Asked on Tuesday morning whether he too had considered resigning, another prominent Brexiteer, Environment Secretary Michael Gove, replied "absolutely not" and declared himself "100%" behind Mrs May's Brexit plan. Where does this leave May? On Monday evening, the prime minister faced down backbench critics at a meeting of the 1922 committee of Conservative MPs, amid rumours they were close to getting the 48 signatures needed to trigger a no-confidence vote that could spark a leadership election. She told her critics the alternative to the party coming together could be a left-wing Labour administration, with Jeremy Corbyn as prime minister. The BBC's assistant political editor Norman Smith said that while Brexiteers were still unhappy with the Chequers plan, their focus was on getting that changed, not on ousting Mrs May. "There is a genuine weariness and horror at the thought of more disruption, turmoil and a possible leadership contest," he told BBC Radio 4's Today programme. "Above all, I just don't think one should underestimate Mrs May's sheer durability - you look around her cabinet table and there are bodies littered all over the place… and she is still there. "Yes, her position is extraordinarily fragile and vulnerable, but it is far from game over." Former Conservative leader Lord Howard called for a "degree of humility all around". He told the Today programme: "I do think it would be extremely foolish and extremely ill-advised for anyone to send in letters to mount a motion of no confidence in the prime minister and I am delighted that good sense seems to be breaking out." The UK's negotiations with the EU will now be fronted by Dominic Raab, a staunch Leave supporter who has been promoted from the job of housing minister. Mr Hunt, who has been health secretary for the past six years, was a Remain campaigner in the 2016 EU referendum. He has since said he is a convert to the Brexit cause. But his appointment means the four great offices of state - prime minister, chancellor, foreign secretary, and home secretary - are all held by ministers who voted to stay in the EU. In his first comments as foreign secretary, Mr Hunt said he would be standing "four square" behind the prime minister "so that we can get through an agreement with the European Union based on what was agreed by the cabinet last week at Chequers". Matt Hancock is the new health secretary, with Attorney General Jeremy Wright replacing him as the culture secretary, and backbencher Geoffrey Cox becoming the new attorney general. Labour leader Jeremy Corbyn said Mr Johnson and Mr Davis had abandoned a "sinking ship", shattering the "illusion of unity" initially surrounding the Chequers plan. The UK and the EU have been negotiating Brexit terms for more than a year now and have been hoping to agree broad aims for their future relationship in October. The aim of the Chequers away day had been to agree the UK position - after two years of discussion - but the resignations have put a question mark over that. The uncertainty in the UK comes before the plan is officially put to the EU, who may well be unhappy with aspects of it they have previously referred to as "cherry picking". One other element of Friday's agreement worth noting is that it pledged to speed up preparations for the UK to be ready to leave the EU without a Brexit deal in March next year. Labour MP and Remainer Chuka Umunna told Today that all the drama of Monday needed to be put to one side, saying: "This has gone from a soap opera to a comedy, and it would be funny were it not for the fact that the subject matter is going to have a fundamental impact on hundreds of thousands of people's jobs."